Marketers around the world are funneling an increasing amount of their ad budgets into digital channels. But that’s just the beginning of the story. Market forces and consumer behaviors are unique to each of the 22 countries examined in this report. In Western Europe, the refugee crisis and the fallout from the Brexit vote in June 2016 have put stressors on government and consumer spending, leading brands to spend cautiously as they head into the second half of the year. In regions where digital ad spending is already high, more outlays are going toward digital video and social media initiatives. The consumer packaged goods (CPG) and auto sectors are leading the way in many mature markets, where the familiarity of traditional TV campaigns is leading to spending in digital video. In less developed markets such as India, Indonesia and Colombia, traditional media still secures the bulk of ad budgets. Brands in these markets have been slower to embrace digital media and lag behind consumers’ use of digital devices, at least in urban areas where the infrastructure supports Wi-Fi and affordable mobile connections. Across all regions, competition among local telecom companies is fierce, with many striving to capture as many converts to mobile as they can. This is increasing digital ad spending, and in some cases, traditional media ad spending as well. With the exception of the least developed regions, the travel sector is spending heavily in digital throughout the world. Consumers globally are turning to the internet and mobile devices to book trips and manage travel plans. 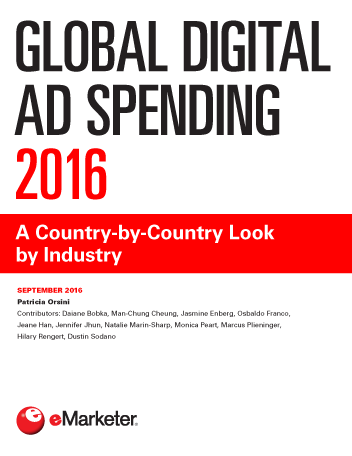 "eMarketer predicts digital ad spending’s share of total media ad spending will increase worldwide in 2016 and 2017. The Asia-Pacific region will see the most rapid growth."